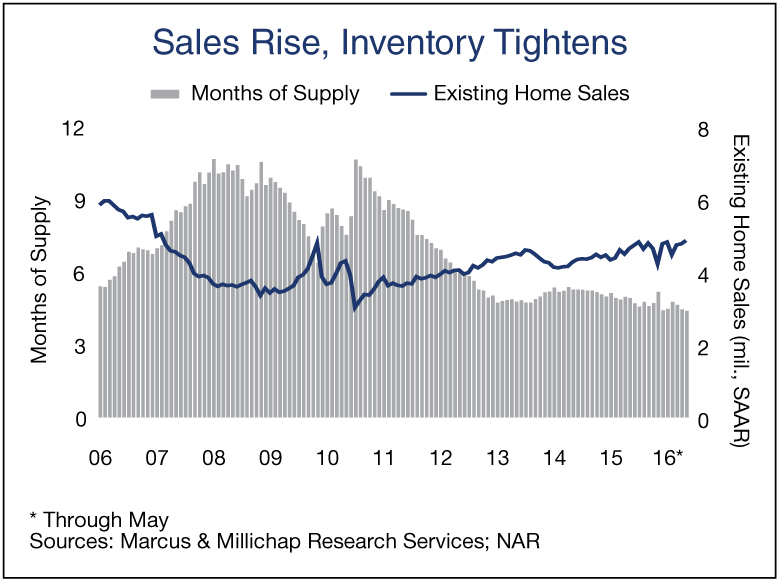 A modest advance in sales activity during the month of May put additional strain on for-sale inventory as the single-family housing market seems to remain caught in a loop that continues to prevent many prospective homebuyers from making a purchase. Sales of existing single-family homes are rising, but the low level of homes available for purchase leaves many would-be buyers unable to transact and is exerting upward pressure on prices. Some of the bottleneck is attributable to the new-home segment, where high prices and a lack of building across a wide range of prices is restricting potential move-up buyers from acquiring new homes. A reduction in the completion of starter homes, in particular, continues to sustain tight vacancy in the multifamily sector as tenures extend for some rental households. With limited inventory of existing single-family homes on the market, some buyers are turning to the new-home segment, supporting additional building. Single-family home completions recently reached their highest level in the current economic cycle as steady buyer traffic enables builders to pre-sell units, triggering a jump in new-home sales of 9 percent over the past year. However, first-time homebuyers have been virtually shut out as builders focus on higher-end housing. The median price of a newly constructed single-family residence advanced over the past year to $290,100, well above the levels posted prior to the downturn, when builders constructed more starter homes. The supply of existing single-family homes continued to shrink during May, maintaining upward pressure on pricing. For-sale inventory dropped to 4.4 months, the lowest level since 2005. While velocity accelerated from the year-earlier level, the tight inventory underpinned a 5 percent rise in the median price of a pre-owned single-family residence to $231,500, surpassing the prior peak. A tight housing market driven largely by limited for-sale inventory is generating strong renter demand as many would-be homebuyers wait on the sidelines. As a result, apartment demand in the second quarter remains robust while vacancy for single-family residences, according to the U.S. Census Bureau, is hovering near 7 percent, down 400 basis points from the peak achieved in August 2009 and at a rate not realized since the early ‘90s. The addition of thousands of apartments to inventory across the nation this year will continue to fill the void as these potential buyers face a competitive purchasing market, keeping vacancy tight as nearly 258,000 units are absorbed. Sales of single-family homes are fueling an increase in consumer purchases of items associated with the formation of new owner-occupied households and the replacement of older items as other homeowners move into new residences. Spending at furniture and home furnishings stores, as well as home improvement stores, rose nearly 4 percent each in the last 12 months. Furniture and home furnishings retailers will continue to play an important role as traffic drivers for retail property owners, since consumers prefer to physically inspect many items prior to purchase. This year, U.S. retail property vacancy will decline 30 basis points to 5.8 percent. This entry was written by marcusmillichap, posted on July 12, 2016 at 6:01 pm, filed under Commercial Real Estate, Housing, Research, Uncategorized. Bookmark the permalink. Follow any comments here with the RSS feed for this post. Post a comment or leave a trackback: Trackback URL.